Constructed using 1.2-1.4mm top grade drum dyed cowhide leather with a combination of perforated and non-perforated leather. Aerodynamic race profile speed hump with perforated top leather panel combines with a hollowed out speed hump for increased ventilation. Removable, level 2 CE-approved shoulder and level 1 elbow and knee protectors can be adjusted using Velcro. Accordion-style expansion panels at shoulders, elbows, waist and knees for increased flexibility and a performance fit. Large seamless panels in the bottom and rear thigh area to maximize abrasion resistance. New accordion-style expansion panel along the upper-side of the suit offers increased flexibility and offers an extended range of comfort for different back protector sizes. New accordion-style expansion panel on the backside of the calf offers a better fit and more flexibility. Heavy duty, stretch Kevlar panels in the arms, inseam and calves for ease of movement. New TPU molded stainless steel external armor in the shoulders and elbows offers increased protection. Rotated sleeves and pre-curved legs for a performance fit in the riding position. New comfort cuff features a neoprene stretch panel that can accommodate different wrist sizes and is so fit to the touch. Mesh lining throughout the suit is removable and washable. Triple-stitched with high strength, bonded nylon thread. Soft Neoprene collar for added comfort. Zippered chest liner pocket. Cuffs feature a spring loaded zipper to eliminate flapping. 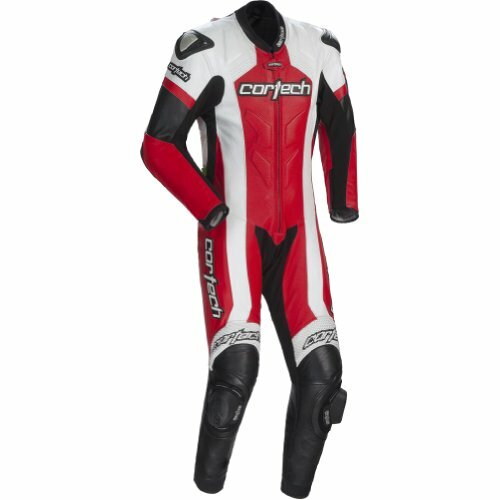 New and Improved Cortech knee sliders are included. CE-Approved Armor - Body armor panels that have passed the appropriate quality assurance tests for safety certification within the European Union. A manufacturer must test both the product and manufacturing process with a qualified third party in order to obtain the certification.